On 21 September 1937, J.R.R. Tolkien’s book “The Hobbit” was published by George Allen and Unwin. It has remained in print ever since, and in December the first film of a “Hobbit” trilogy, directed by Peter Jackson will be released. How “The Hobbit” came to be published is fairly well known. Tolkien had shown the completed typescript of the book to one of his former pupils, Elaine Griffiths, who became a family friend. On Tolkien’s recommendation, Griffiths was engaged by George Allen & Unwin to revise a translation of Beowulf. One day, in 1936, Susan Dagnall, a member of Allen & Unwin’s staff came to Oxford to talk with Griffiths about her project. From her she learned of the existence of an unfinished children’s story written by Professor Tolkien. On Griffiths suggestion, Dagnall visited Tolkien at his home in Northmoor Rd., Oxford and asked to borrow the manuscript. She was given it and took it back to London. She read it and decided it was worthy of consideration, although she stopped just after the death of Smaug. However, she returned it to Tolkien and suggested that he finish the work so that it might be considered for publication the following year. 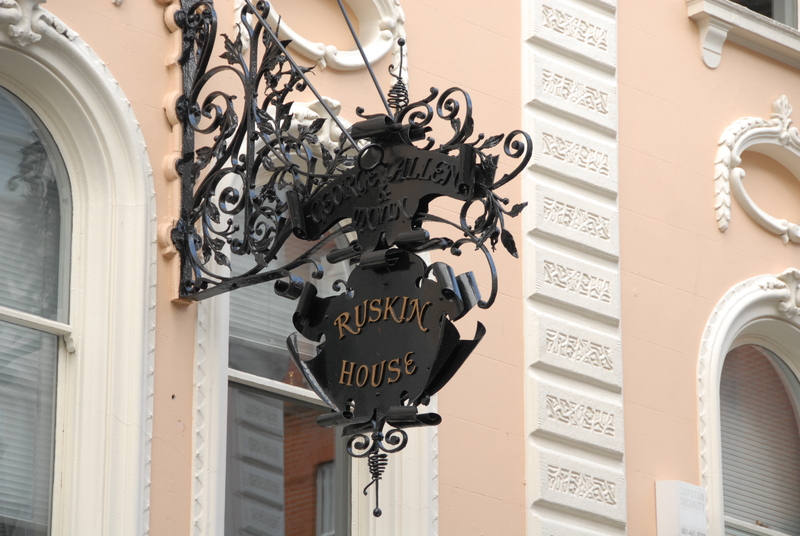 sent to Allen & Unwin’s offices in Museum St (the sign is still there although the publishing house has been long gone). But was it completed before this? Rayner was paid a shilling for the report and the book was accepted for publication. However, it was decided, contrary to Rayner’s recommendation, that the book did in fact require illustrations and Tolkien submitted some of his own drawings and eight of his blacvk and white illustrations were accepted. He had also prepared maps which were used as end-papers, meaning that Tolkien’s plan for “invisible lettering” on Thror’s map could not be realised. The page proofs were sent to Tolkien in February 1937 and characteristic of his writing became immediately apparent – revisions! He decided that there should be substantial changes for he had let the manuscript go without checking it with his usual thoroughness and he was unhappy about a number of passages in the story. He found inconsistencies in the topography, details which only the most painstaking reader would notice. He was uncomfortable with some passages where he considered the style to be patronising and in a few days had covered the proofs with many alterations. The book was published on 21 September 1937. Tolkien was nervous about the Oxford reaction. He was holding a Leverhulme Research Fellowship and wondered how he would convince people that the book was not the fruits of research for 1936 – 7. He need not have worried. Oxford paid the book almost no attention. But that was not the case elsewhere. The book received an accolade in the Times and his fellow Inkling and friend C.S. Lewis, reviewer for The Times Literary Supplement, was responsible for getting the notice in the senior publication. The first edition sold out by Christmas. In the United States it was awarded the New York Herald Tribune prize for the best juvenile book of the season. Stanley Unwin wrote to Tolkien, advising that the public would want to hear more about hobbits. But that was not to be – until 29 July 1954 when The Fellowship of the Ring was published. But when did the journey of writing The Hobbit begin? The evidence is often unclear and at times contradictory, as to the manner in which and the time at which the book was started. What followed was a form of story development as Tolkien told the story to his children. This in itself has given rise to contradictory evidence about the dating of the commencement of the idea. Although Tolkien places it after the move to Northmoor Rd, family recollections place it earlier. “clearly recalled his father standing with his back to the fire in his study at 22 Northmoor Road and saying that he was going to start telling his sons ‘a long story about a small being with furry feet, and asked us what he should be called – then, answering himself, said “I think we’ll call him a ‘Hobbit’.”‘ (quoted in Christopher Tolkien’s Foreword, p. vi). Father John Tolkien, the eldest son (1917-2003), was equally definite that the story began before the move from 22 to number 20 Northmoor Road: ‘The first beginnings of the Hobbit were at 22 Northmoor Road; in my father’s study, the room to the left of the front door as one looks at the house. I remember clearly the wood block floor, mats etc …. [T]here were no family readings for us all in 20 Northmoor Road, where we moved early in 1930. I was 12+ & I think could read for myself! The room with its many bookshelves was not conducive to that son of thing. As far as I remember the readings were always in the study … The Hobbit started with a couple or so chapters, to which if we were lucky a couple or more would be added at the next Christmas … I went to boarding school in September 1931 and so although very close to the family, all sorts of stories may have been told which I cannot date. 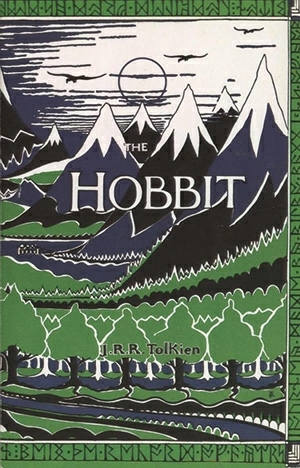 ‘ Carpenter, writing in 1976, notes that Michael and John Tolkien ‘are not certain that what they were listening to at that time was necessarily a written story: they believe that it may well have been a number of impromptu tales which were later absorbed into The Hobbit proper’ (Carpenter, p. 177). In support of his claim for an earlier origin of the book, in his guest-of-honor speech to the Tolkien Society’s Annual Dinner in May 1977 Michael described the stories he and his brothers and sister had written in imitation of The Hobbit. Michael recounts that these stories were populated by characters like Philpot Huggins, Ollum the giant frog, blokes (hobbits), smellers (wolves), the dwarves Roary, Borey, Gorey, Biffer, Trasher, Gasher, Beater, Bomber, Lammer, Throw-in (the chief dwarf), and young Blow-in and Go-in; Alben Bolger the troll, joshers, snargs, and the wizards Kimpu, Mandegar, and Scandalf the Beanpiper. Michael Tolkien dated his own contributions to this family apocrypha to 1929, when he was nine years old (Michael Tolkien, May 1977 speech; see also Christopher Tolkien, Foreword, p. vi), and thus argued that The Hobbit must have been begun by that date. While it is quite likely that many elements incorporated into The Hobbit came from family lore predating the book … and The Hobbit was undoubtedly influenced by the other stories Tolkien read his children in the ‘Winter Reads’ (which, despite Fr. John’s comment, continued to at least 1936 and probably beyond), Michael’s own account provides evidence that the stories he describes could not have preceded the actual writing of the book; too many of the names are parodies of forms that only emerged at a later stage, well into the composition of the manuscript. For example, Scandalf the wizard and Throw-in the head dwarf are clearly modelled on Gandalf and Thorin – but for the first two-thirds of the story the wizard was named Bladorthin and for more than half of it the chief dwarf is named Gandalf, not Thorin; these two characters seem not to have received their now-familiar names until around 1932. Furthermore, Tolkien himself is quite clear on the point that he made up the name ‘hobbit’ spontaneously at the moment of writing it down – that is, that the word itself emerged in a written text. It may therefore be concluded that the manuscript was probably finished between the end of 1932 and the beginning og 1933 and that it was given to Lewis for comment. It is clear that Lewis had a complete story, for he makes reference to the final chapters. This analysis is essentially confirmed by Scull and Hammond. What readers of The Hobbit did not appreciate was that there was a deeper “back story” to the Hobbit and the world in which it was set. Tolkien’s publishers were unaware of it, when Stanley Unwin requested more hobbit stories, although Lewis and The Inklings were aware of Tolkien’s development of the Mythology for England. In his excellent edition of the manuscript of The Hobbit John Rateliff presents us not only with the way in which the story was created and developed through changes, recasting and emendations but he also places the story into the Middle-earth context. For example, one of the versions, referred to as the Bladorthin typescript, makes reference to the mines of Moria drawing us into the wandering of the dwarves from the end of the First Age when the cities of Nogord and Belegost in the Blue Mountains were ruined at the breaking of Thangorodrim. Belegost and Nogrod are indicated “off-map” in a drawing of a map completed by Tolkien in the mid to late 1920’s. The origins of the Necromancer – Sauron in The Lord of the Rings – goes back to the end of The Book of Lost Tales period where he is known as Tu, a pupil of Melko, who escaped from Valinor after the destruction of the Two Trees and set up a wizard kingship in the middle lands. Yet although Tu learned much black magic from Melkop he was not evil. A second character appears known as Fukil, Fankil or Fangli who was a servant of Melko and who corrupted the newly awakened humans. Neither of these characters appear after Lost Tales but a synthesised character named Thu – also known as Gorthu or Sauron – appears in The Lay of Leithian – an continues to play a major part in the mythology thereafter. This information leads us to answer the suggestion that Peter Jackson is squeezing the 255 pages of The Hobbit until the pips squeak by making a movie trilogy of the book. There clearly is a back story – not only in the Appendices to The Lord of the Rings but also in Tolkien’s deeper mythology. It seems to me that The Hobbit may be a little more than a cinematic adaptation of Tolkien’s book, but a tale with a deeper background hinted at in the manuscripts but which may now be made a little clearer. Although he may not have realised it he was anticipating a large and critical fan audience that developed especially after the publication of The Lord of the Rings. Christina Scull and Wayne Hammond The J.R.R. Tolkien Companion and Guide: The Readers Guide (Harper Collins, London 2006) under the entry “The Hobbit” p. 384 et seq. This is a very nice and informative write-up, indeed. I hope you don’t mind sharing it.